The Inca are certainly the best-known pre-European culture of Ecuador, but they were hardly the only one. 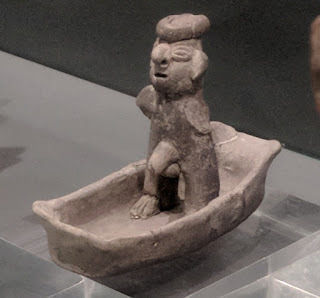 In fact, they were latecomers on the scene, invading from Peru less than one hundred years before Francisco Pizzaro arrived from Spain to destroy their civilization. Prior to the Inca's arrival, the land that is present-day Ecuador had been occupied by a succession of regional cultures, several of which used small watercraft. 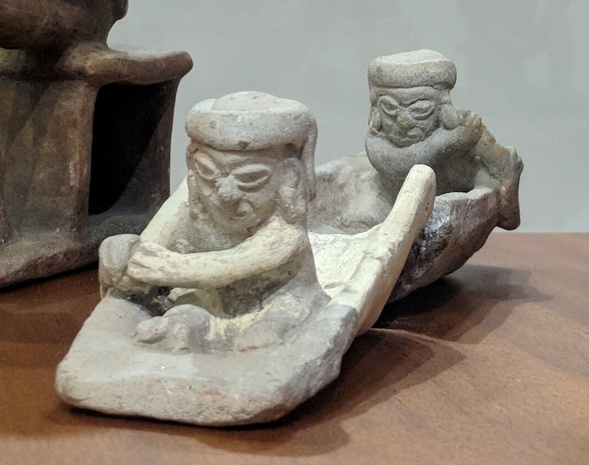 Dugout canoes played an important enough role in some Ecuadorian cultures to have warranted frequent representation in ceramic miniatures. Although we don't know the purpose of these sculptures, it's probable that they had ritual significance, as is the case with almost all art from almost all ancient societies. In spite of their pleasing aesthetics, it is unlikely that they were made for purely decorative purposes. With the exception of the anchor, the following photos were taken through glass exhibit cases. 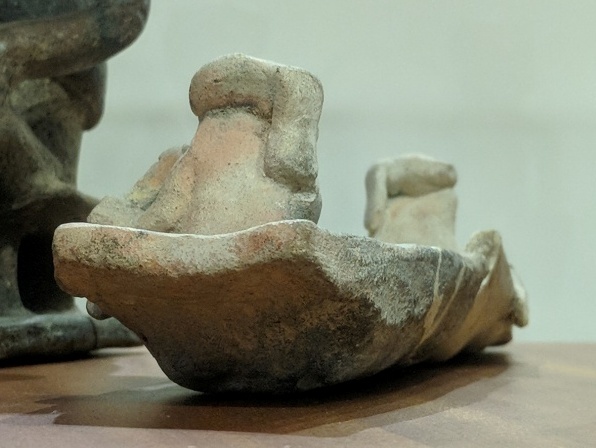 The first three boats (six photos), the paddlers without canoes, and the anchor are at the Museo Antropologico y de Arte Contemporaneo in Guayaquil. The last canoe miniature (three photos) is at the Archaeological Museum of the University of Cuenca. Click any image to enlarge. 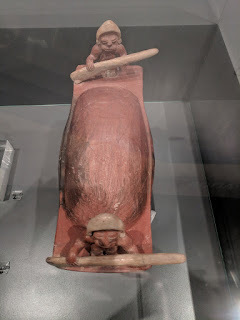 Chorrera dugout canoe with two paddlers. 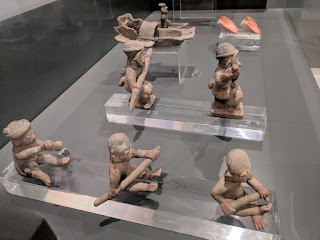 ("Existing in the late formative period the Chorrera culture lived in the Andes and Coastal Regions of Ecuador between 1000 and 300 BC." [Wikipedia]). The canoe has overhangs at both ends upon which the paddlers squat. With its full-width bow and stern platforms, the canoe is nearly rectangular in plan view. 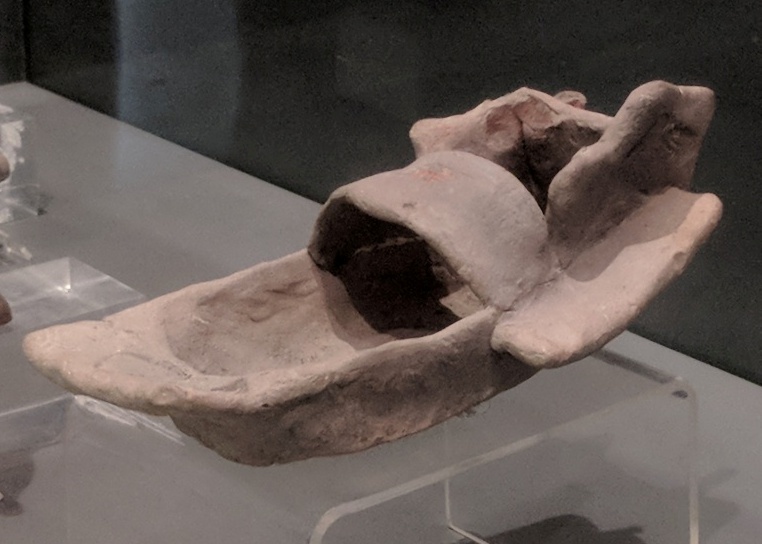 The deep interior may simply represent a real canoe's hold, or the sculture might have been used as a vessel for food or other ritual offerings. Both paddles are held to the same side of the canoe. The squatting bowman holds a paddle with a long blade that tapers into the shaft and a square bottom end. There is no end grip on the shaft. The paddler wears decorative ear plugs and a helmet of some kind. Tolita canoeist and canoe. More crudely fashioned or "schematic" than the previous one, this canoe nonetheless shows small bow and stern platforms. Although the canoeist lacks a paddle, he is otherwise well-equipped. 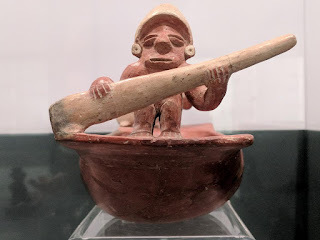 The Tolita lived on the northern coast of Ecuador from 500BCE to 500CE. 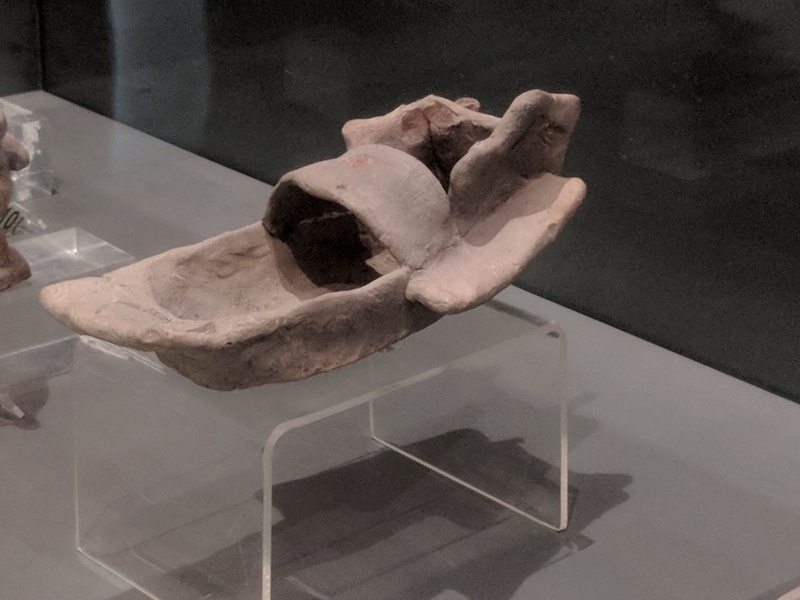 The seat backs, and possibly the shelter, indicate the boat was used for transportation of people, although carrying cargo in addition cannot be ruled out. These features also appear to indicate a boat for a user of high status, perhaps a merchant who could afford to sit back and relax while others worked the boat. The "side decks" are a curiosity Did men stand on them to paddle or pole the boat, leaving more room in the hull for passengers and/or cargo? If men stood on both of them simultaneously, the boat would have adequate balance. But if one paddler were to step or fall off, the boat might become highly unstable. Perhaps, instead of decks, they represent sponsons to increase the boat's stability and buoyancy, or simply planks that would provide momentary resistance if the boat were to heel suddenly. This angle shows a clearer view of the seat backs or coaming. 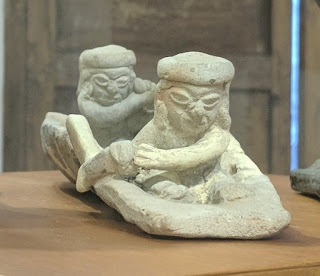 Two Tolita canoe paddlers. 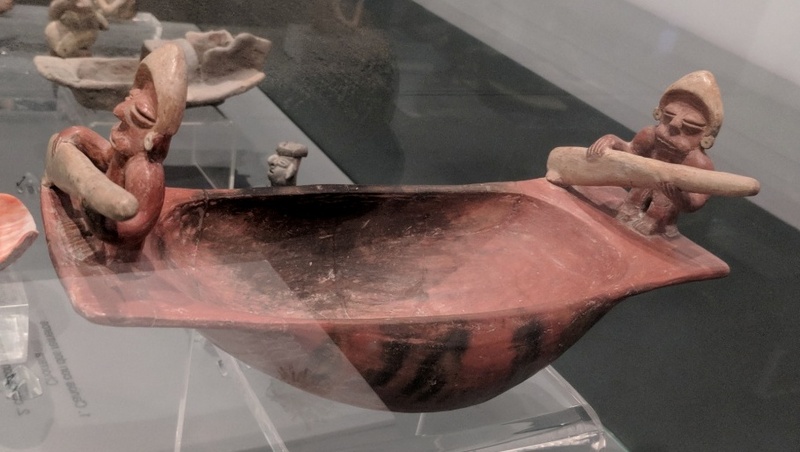 I speculate that in this and the following image, the missing canoes were made of wood, which disintegrated prior to the recovery of the ceramics. Unlike the Chorrera paddles, these have lanceolate blades. The paddlers squat, holding their paddles in a more realistic fashion than the Chorrera paddler, with their top hand nearer the end of the shaft (which, like the Chorrera example, lacks an end-grip). The paddlers appear to be wearing skirts and helmets. Three more Tolita paddlers. The middle and rear figures sit with their bodies facing front and their legs extended. The front figure is in a more dynamic pose: his torso is twisted to his "on" paddling side and his onside leg is crossed over his offside leg. All three figures wear helmets but, unlike the previous example, their legs are bare. 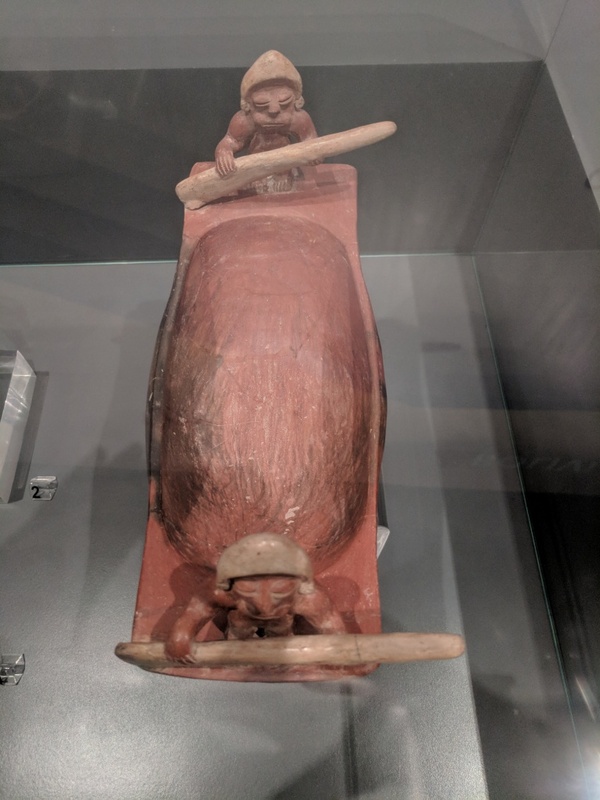 Another angle showing the two groups of paddlers (and, behind them, the covered boat [left], two pieces of spondylus shell [right], which were used as currency and for decorative work, and the rude canoeist). Tolita canoeists in a dugout canoe. The canoe, which is broken crosswise amidships, has bow and stern platforms and a nearly rectangular plan view. The paddlers' disc-shaped headgear with side flaps is similar to that worn by the aft-most paddler in the group of three above. They hold their paddles on opposite sides of the canoe. 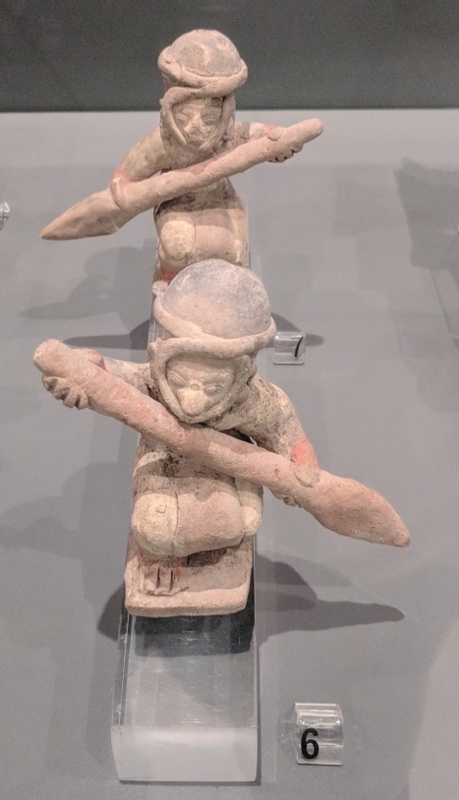 Their legs are bare, and the bow paddler's legs are crossed. The same item as above. Although simply rendered, the figures have the realistic energy of paddlers concentrating at their work, straining to push forward. 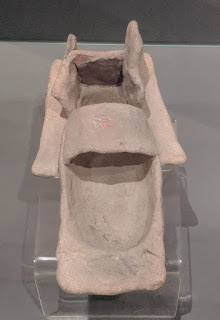 Aft view of the same item, showing the canoe's broad stern platform, slab-shaped sides, and rounded bottom. Stone anchor from the Manteño civilization, which dominated Ecuador's central coast from 850CE to 1600CE. The Manteño used large sailing rafts of balsa logs to conduct intensive trade along the coast of Ecuador and as far north as Central America. 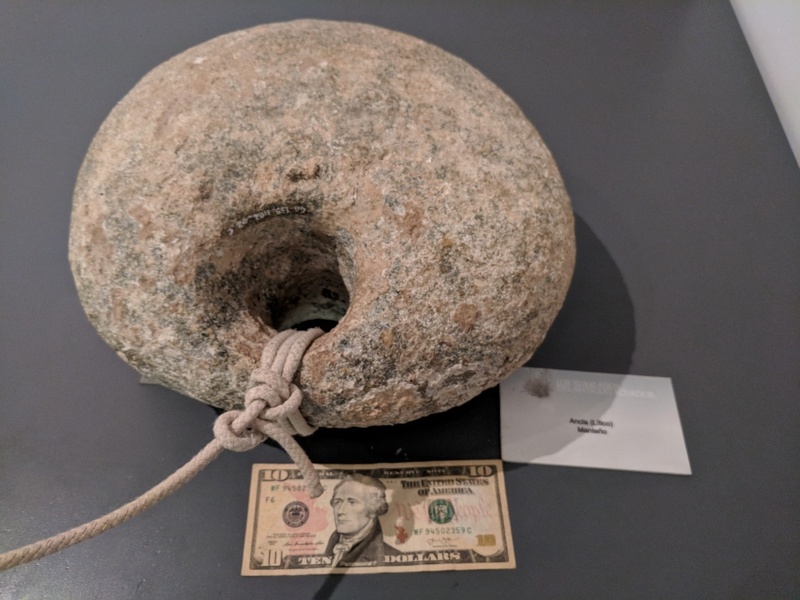 This anchor, however, appears much too small to have been used on an oceanic raft and was probably used with a smaller watercraft. (American currency is for scale. Rope is not original).